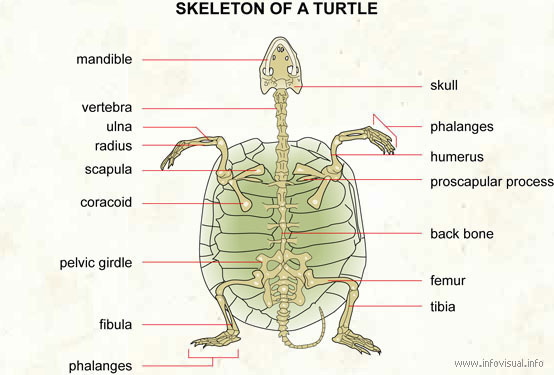 Skeleton of a turtle - Visual Dictionary - Copyright © 2005-2016 - All rights reserved. [img]https://infovisual.info//storage/app/media/02/img_en/021 skeleton of a turtle.jpg[/img] [url=https://infovisual.info/en][/url] - [url=http://www.infovisual.info/]Visual Dictionary[/url] - Copyright © 2005-2016 - All rights reserved. Skeleton of a turtle: reptile with an oval shell and a horned beak. It has a very short tail and four short legs, and moves very slowly. Skull: bony case of the brain of the tortoise. Phalanges: small bones forming the fingers. Proscapular process: bone of pectoral girdle of a tortoise, situated in front of the coracoid. Back bone: vertebral column of a tortoise. Tibia: one of the two leg bones. Phalanges: small bones forming the toes. Fibula: one the the two leg bones. Pelvic girdle: set of bones to which the limbs of a tortoise are attached. Coracoid: bone of the pectoral girdle of a tortoise. Radius: one of the two bones of the forearm. Ulna: one of the two bones of the forearm. Vertebra: each of the bones forming the spine of a tortoise. Mandible: lower jaw of the tortoise.